Granite Park Chalet is on the west side of the continental divide, north of Going to the Sun Road in Glacier National Park. 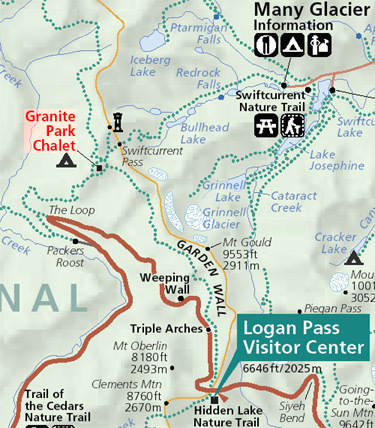 It is accessible from two trailheads along Going to the Sun Road, as well as from the Many Glacier area to the east and from Goat Haunt to the north. No pets are allowed in the back country. Trails are for hikers and horseback riders only, no bikes or other 'vehicles' allowed. Parking is extremely limited at the Loop, Logan Pass and Swiftcurrent. To help alleviate parking congestion we encourage you to car pool or use public transportation for access to trailheads. Try Glacier's Shuttle System. Trek the famed Garden Wall, along the Continental Divide. This is the most popular route into Granite Park Chalet. Enjoy the many beautiful panoramic views afforded from this trail. Rock formations, flowers and occasional glimpses of mountain goats, big horn sheep and deer make this a most memorable trip. This trail typically does not open until after the first week in July. The opening of this trail depends on the weather and snow conditions for any given year. If you are planning an early season trip into Granite Park Chalet be sure to check the trail status online or at a park visitor center. This is the shortest trail to Granite Park Chalet. Experience firsthand the effects of the 2003 fires! Observe new undergrowth, wildflower displays, and new vistas. TRAILHEAD: The switchback on the Going to the Sun Road eight miles west of Logan Pass, known as the ‘Loop’ trailhead. DIFFICULTY: A 2300' climb. A trail where the climb is worth it! Prepare yourself for waterfalls, wildlife, switchbacks, and stunning panoramic views of the Sherburne Valley on this exhilarating hike! Many guests depart from Granite Park to descend this trail on their way out. Prearrange transportation at Waterton Lakes National Park and continue North on the Highline Trail to CANADA! Sign up for an Interpretive Hike. Reservations are required. The highest Lookout in Glacier, with an unrestricted 360 view. Head north and follow the continental divide to Ahern Pass, a quiet trail where spectacular views await you. Hike a well traveled steep trail to view glaciers along the continental divide. View Bear Valley and Heaven’s Peak right from Granite Park Chalet!